I thought that I would pick up on a couple of Luit's posts to the Forum on our site. 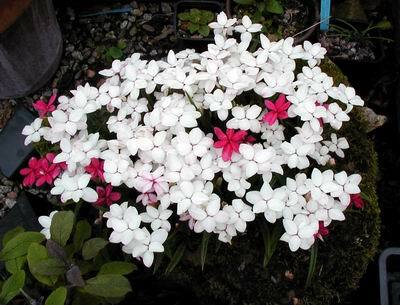 If you have not visited the forum and in particular the 'Flowering Now' threads you should. Luit showed a very large number of Dactylorhiza growing in one of his fields and we have a number in our garden just now. 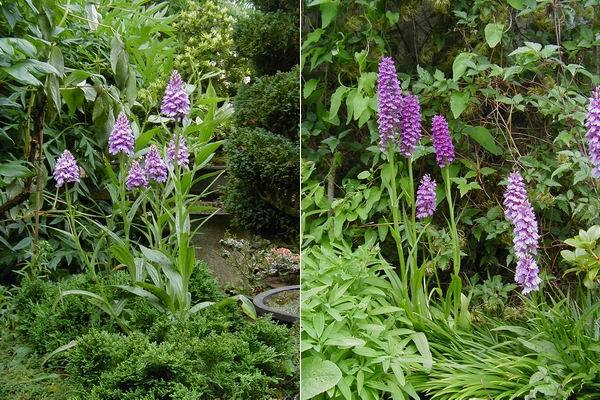 The bottom left small picture is what we call Dactylorhiza elata and I suspect that this is what Luit is growing as D. foliosa. Who is correct, I am not sure as I have seen plenty of this plant called both these names. The small picture bottom right is the Cruickshank Hybrid a very vigorous form with very spotted leaves which appear very early in the year, sometimes they appear in December. 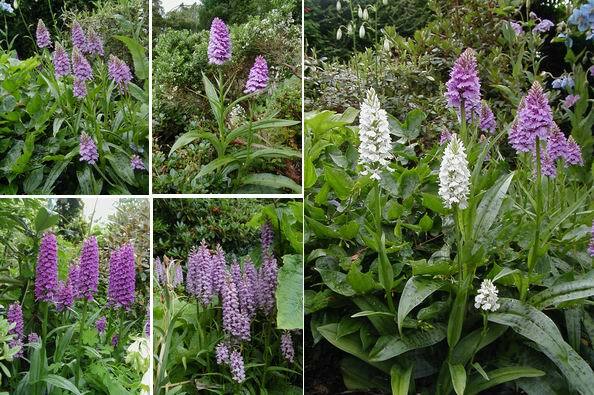 The white flower in the large picture is Dactylorhiza 'Eskimo Nell'. All the other pictures are of self sown seedlings that occur in the garden. 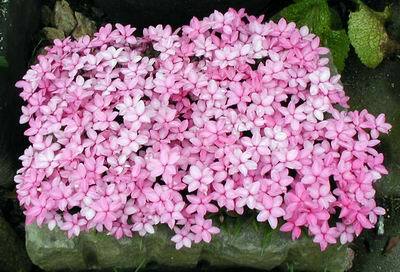 They mostly appear in troughs where there is little disturbance and they seem to favour coming through some mat or cushion forming plant. The one on the left is coming through a trough with dwarf conifers and the right hand ones are very happy trough companions to Iris hookeri. 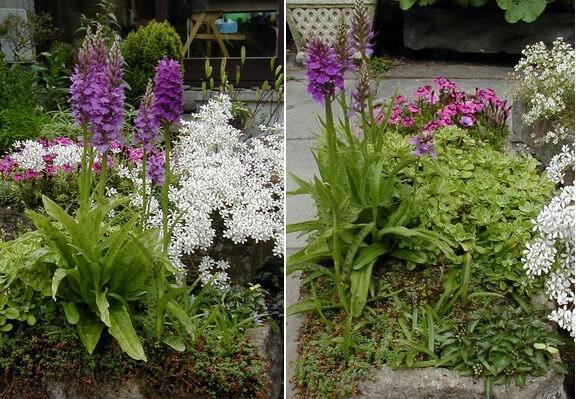 Two views of the same trough and if you look carefully you will see masses of Dactylorhiza seedling leaves to the right and in front of the flowering plants. A few years ago when the seed head of the orchid was ripe I bent it over so the seed would spill out into the trough and there are now around a hundred seedlings in this trough. We have never succeeded in germinating Dactylorhiza in pots. This trough has a group of seedlings from our own seed and I think they look nice growing as a mixture. 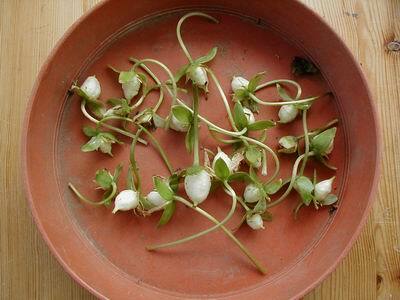 Talking of seed I have started to collect the pods from some of the dwarf trillium. I take them with that bit of the stem which holds them above the leaf before they open. The white membrane of the seed pod can seem quite firm one day and the next time you look it has disintegrated and the seeds are spread so I now collect them and leave them to open in a container so I can be sure that it is me, and not a slug, who gets the seed. 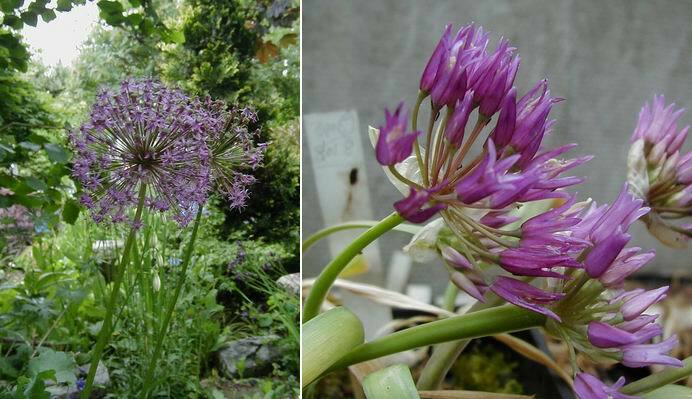 Here is the sublime and the ridiculous; a very tall Allium at over one metre and the dwarf Allium falcifolium grown from seed collected in Mendocino county California both are welcome summer-flowering bulbs. 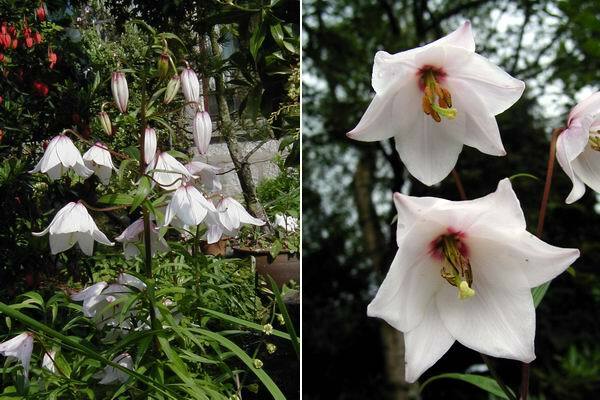 Another of those beautiful lilies that enjoy our cool northern gardens is Lilium mackliniae, we have lots of it all over the garden and it produces lots of seed which will germinate and flower in three years if grown in ideal conditions. There is a slight variation in the habit and the markings on the inside of the flower. This is a very good multi- flowered stem with a nice red throat in the flower. 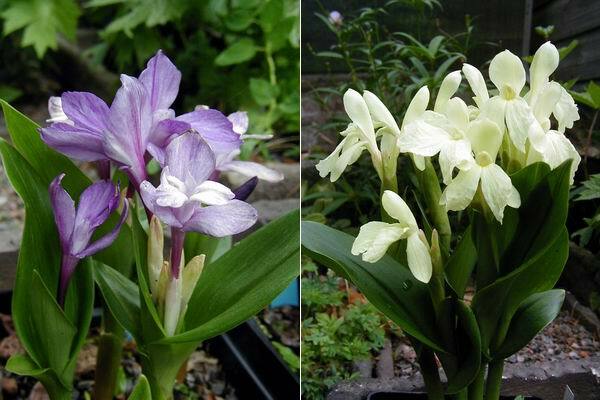 Here are two plants from a batch of Roscoea humeana seed; the purple one is the sort of colour range we expected but we were totally and pleasantly surprised by the yellow one. Could it be an interloper?